saucysmile | Where the belly rules the mind! Yep it’s that time again. I just can’t seem to get enough of my whiskey! This time I’m gonna tell you about one of my absolute favorite cake recipes. I made this for the first time as my birthday treat this year (yes I always make my own birthday cake!). I’ve made this a few more times since then, but the addition of the chocolate ganache is genius. This is my most popular dessert request. Get ready for something rich, decadent, indulgent…and yes, full of frisky whiskey goodness! For Father’s Day this year, I decided to test a savory shortbread idea for my dad. I like testing my shortbread flavor ideas on him, since he’s such a willing guinea pig. I had some leftover pecans from making bourbon balls and decided to add blue cheese to add some real flavor. So here goes with my Blue Cheese Pecan Shortbread. Time again to get frisky with the whiskey! I’ve got another recipe idea featuring White Pike Whiskey. I came up with this idea as I started thinking about the Summer season. Summertime always makes me think of icy treats. So what’s better than a fudgesicle on a hot night? A boozy fudgesicle or as I like to call them “Pike Pops!” You’ll never go back to regular fudgesicles again. I’ve developed a fascination lately with boozy cooking. It’s a fun way to experiment with new recipe ideas. I’ve been cooking a lot with whiskey, especially in my baking. Check out my last post for Kentucky Bourbon Balls. My friend is the Brand Manager at White Pike Whiskey, a white whiskey distilled in upstate New York. White whiskey has a totally different flavor profile than aged whiskey; it has a clean finish and mixes well in drinks. So let’s take a boring dish like chicken and kick it up a notch. Time to get frisky with White Pike Whiskey! A couple of weeks ago, I noticed that Kings County Distillery wrote a post on their Facebook page asking if anyone would make them Kentucky Bourbon Balls. I had never made these before but I’ve been having lots of fun lately experimenting with using spirits in my baking. So I figured what the heck, I’ll give it a try. I offered to make the bourbon balls if they agreed to give me some their whiskey. And they took me up on my offer! My friend Mindy was throwing a cool aphrodisiacs-themed event at her perfume shop MIN New York. If you love unique, niche fragrances, you definitely need to check them out, I won’t buy my perfume anywhere else. Mindy always throws great events so I already knew I wanted to go to this, but thought it would be fun to make some desserts featuring the aphrodisiac ingredients/flavors she would be highlighting. I chose to feature basil and lemon. I love these flavors together and thought basil would be a surprising choice for a dessert. Last night I was lucky enough to attend Luckyrice’s Ramen Slurpfest dinner. Ramen is one of my favorite foods of all time, so a night filled with uniquely-crafted dishes from leading ramen specialists was something I couldn’t pass up. My fellow ramen-obsessed fans gathered for a four-course tasting menu. So let’s get slurping! When my friend Hazel aka “Tasty Pursuits” asked me to be one of the food bloggers at her C-CAP Sweet Sensations Dessert Event, I was so excited. Then I freaked out a little. All my friends know how much I LOVE to cook, but I’ve never actually cooked for an event before. I really wanted to do something special, something I hadn’t done before and it had to be for 80 people. I racked my brain for 3 weeks coming up with ideas. A chance dinner at Reynard’s with my sister came my inspiration. We ordered the Black Tea Pot De Crème for dessert and absolutely loved it. It was light and creamy and delicious. I had to put my own twist on the pot of course. There are tons of recipes for Chocolate Pot De Crème, but I wanted a flavor that was more unique to me. If you follow my blog, you know one of my favorite combinations of flavors is Matcha and Black Sesame. And voila, an idea is born! C-CAP Sweet Sensations Dessert Event! On Sunday, April 21st, I was honored to join some chefs and fellow food blogger bakers at C-CAP Sweet Sensations Dessert Event! The goal of the day was to raise funds and awareness to support scholarships and programs for at-risk students in Careers through Culinary Arts Program (C-CAP). 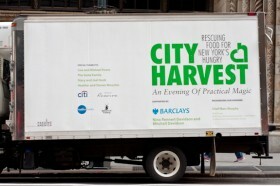 100% of the proceeds will go to C-CAP, www.ccapinc.org. 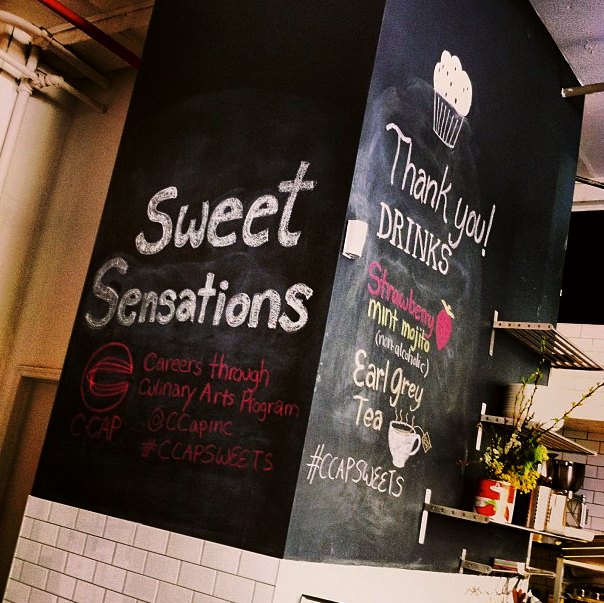 Event Alert – C-CAP Sweet Sensations Tasting Benefit April 21, 2013! 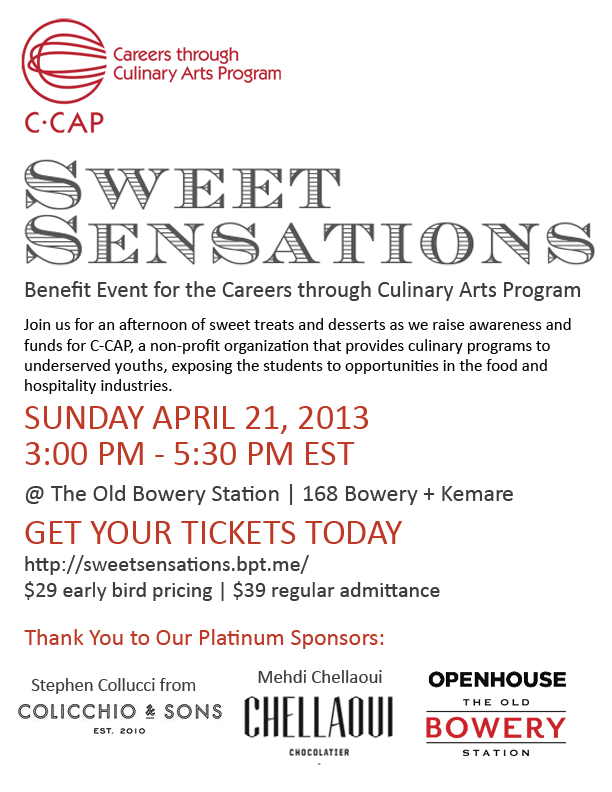 Come join me at C-CAP Sweet Sensations Tasting Benefit on Sunday, April 21, 2013!